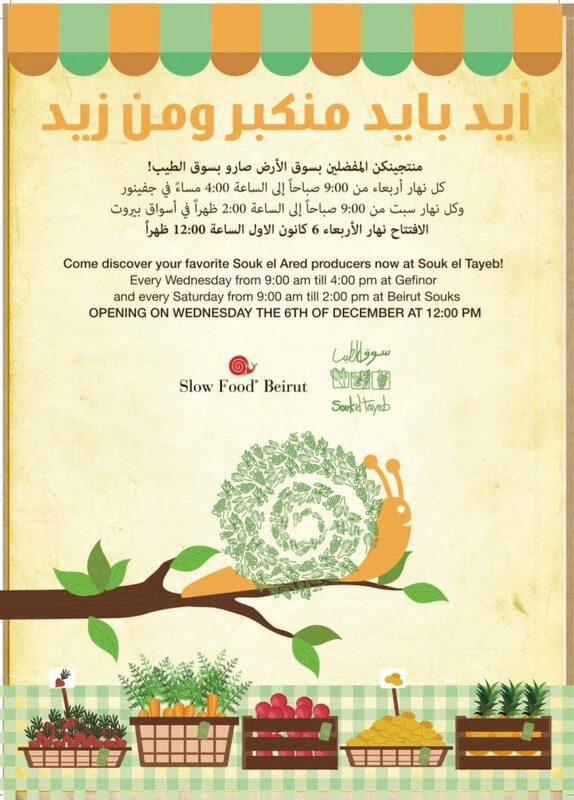 Sharing the same goal as Souk El Tayeb, Souk El Ared has joined our family! Souk El Ared is operated by Slow Food Beirut as a Non-governmental organization that was founded in 2006 with an objective to implement strategies in Lebanon to safeguard local food identity, while supporting local agricultural production. Souk El Ared has moved two streets downwards, and a day after. You can now find them at Gefinor on Wednesdays from 9:00am till 4:00pm! They might have changed their location, but their products are still the same with new faces by their sides and an even bigger variety of products to choose from. Together we can achieve the goal of helping farmers in the market and raise more awareness to the traditional food that is at risk in our country – Lebanon. You can now find them as part of Souk El Tayeb Family starting December 6th, 2017 at Gefinor every Wednesday.